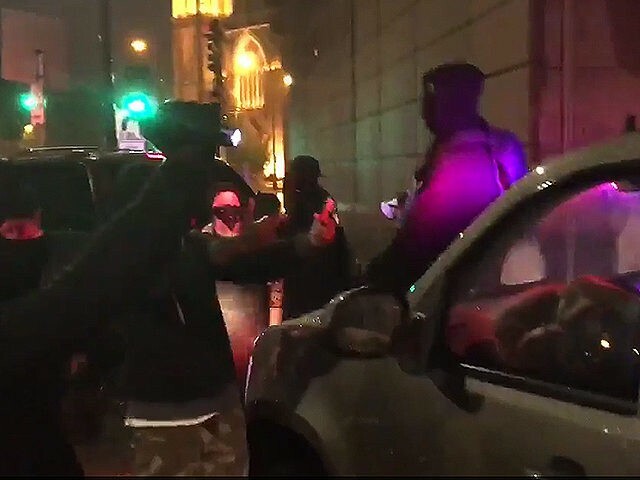 Progressive activists attacked Donald Trump’s motorcade and supporters in Minneapolis late Friday night, but the local media downplayed the unprecedented attack against an American presidential candidate. Here’s the attack on Trump’s motorcade. The Star Tribune site found a way to blame Trump and his supporters for the physical attacks by progressives, even while it posted a video showing a vicious public attack on a Trump supporter, and an apparent theft in public from a Trump supporter being escorted into the event. The article mentions the violence in the second paragraph, while describing it as merely some people getting pushed, jostled and spat on, and suggests in the lede that the violence was Trump’s responsibility. The New York businessman made his first visit to the state as the Republican presidential candidate for a private nighttime fundraiser at the Minneapolis Convention Center. Dozens of protesters gathered out front ahead of the event and marched around the large building. Later in the ­evening, a smaller contingent grew unruly. Some fundraiser attendees were pushed and jostled, spit on and verbally harassed as they left the ­convention center. Here are tweeted reports from Renee Jones Schneider, a photographer at the Star Tribune in Minneapolis, who recorded Trump’s event and supporters being attacked. Jaime DeLage, a reporter at the St. Paul Pioneer Press, tweeted out coverage of the fundraiser. Before the attacks, the protestors first tried to block entrances.